Michael Deal, who previously gave us this infographic of every pitch of the All-Star game as part of his Statlas project, has developed a new take on the MLB box score. The sample above shows the 8th and 9th inning of Game 2 of the ALCS, which, as Deal's line-and-node representations make clear, were a doozy. 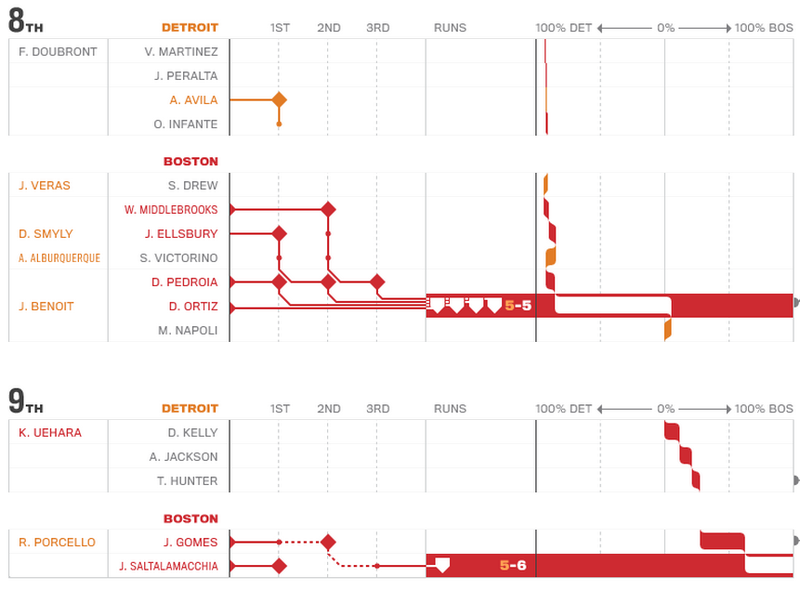 Unlike traditional box scores, Statlas's visualizations return the hits and outs of an inning to the actual context of the game by showing the impact of every play on each team's win expectancy (the ribbon on the right). Ellsbury had two walks on the day, but the second, in the eighth, ended up being a lot more valuable than the first. It turns out that Ortiz's home run was pretty important too, as far as hits go.